This was a week long cruise from Southampton, England to northern Spain with a call in Le Harve, France. 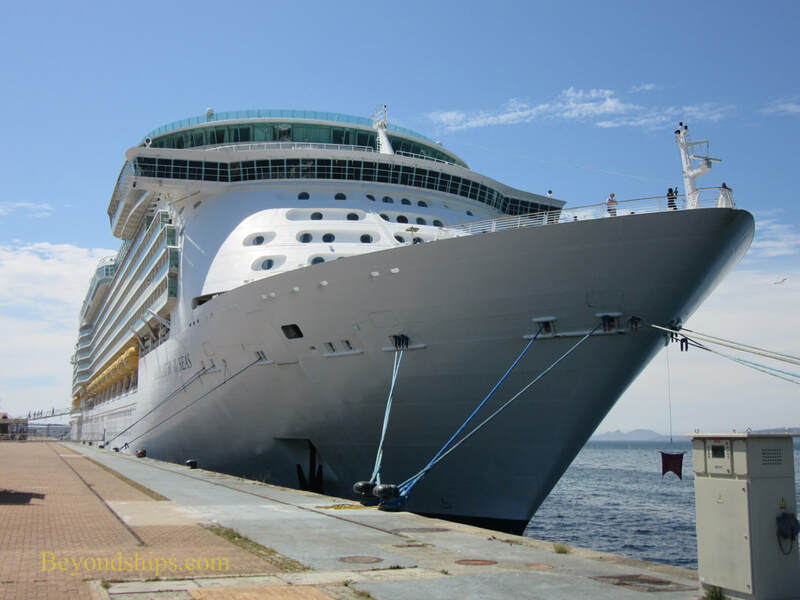 Navigator of the Seas seeks to present a relaxed but active family-friendly cruise experience. This she does quite well. The ship is one of Royal Caribbean's Voyager class ships. At one time in the not too distant past, the Voyagers were the largest cruise ships in the world. Ships have gotten bigger but even so at 142,000 gross tons, Navigator is still a quite large ship. One consequence of this is that the ship can offer a large variety of things to do. It has numerous bars and lounges; a spa with salon and fitness center; four specialty restaurants; a large modern theater, an extensive casino; and an ice skating rink, which hosts ice skating spectaculars. For outdoor activity, there are two pools, several whirlpools, miniature golf, a surfing simulator and Royal Caribbean's trademark rock climbing wall. There is also an indoor mall (the Royal Promenade) running along the centerline with shops and casual eating venues. On sea days, the entertainment staff conducts organized activities such as quizzes, dance classes and various games. On port days, the activity schedule is much reduced reflecting the fact that most passengers go ashore. Sadly, there is little in the way of enrichment such as lectures and cultural activities. In the evening, the ship pulses with entertainment. The largest entertainment venue is the multi-level Metropolis Theater. Here, the ship's cast professionally performed two musical revues. On the nights when they were not performing, there were visiting performers who included a hypnotist, singers and comedians. Of these, the most impressive was the Tenors of Rock, three performers from the London stage who presented high-energy performances of rock and popular tunes. 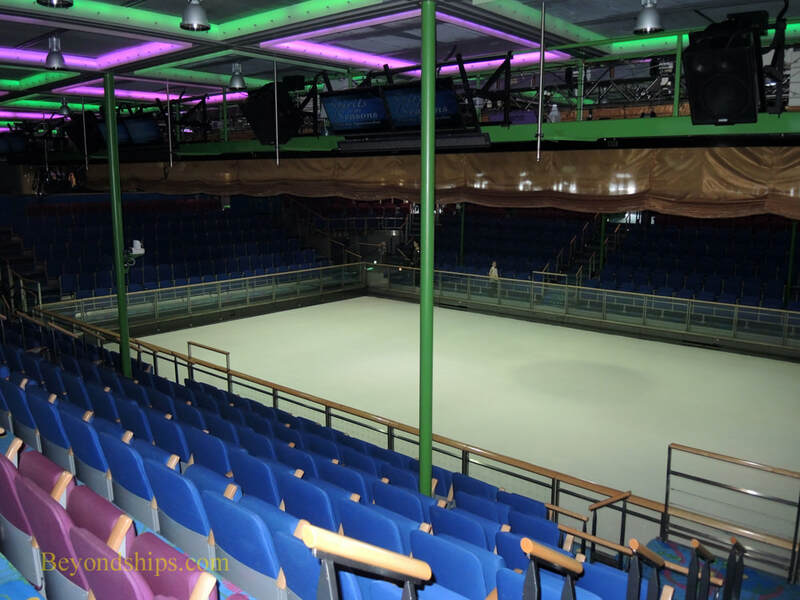 As mentioned earlier, there were also shows in the ice skating rink. These are in the nature of dance shows with theatrical lighting, and popular music punctuated with virtuoso skating. Although I am not a fan of skating, I always make room in my schedule to see these performances when I am on a Voyager, Freedom or Oasis class ship. The Royal Promenade is also used as an entertainment venue with theme parties including on this cruise the 70s Disco Inferno Dance Party and the Rock Brit Party. In these, the entertainment staff perform on bridges over a promenade packed with humanity. Light-hearted fun. If this is not enough, there is live music in many of the bars, various quizzes and games, and movies on the ship's outdoor video screen. For many cruisers, dinner is the highlight of the evening. The main dining room is an impressive room that soars through Decks Seven to Nine. Two levels are dedicated to the traditional fixed seating dining system while the third operates on a flexible dining system. I found the food enjoyable and was pleased with the service. Navigator has four specialty restaurants. I managed to get to two of these plus the extra-tariff Johnny Rocket's casual venue. (See separate review). The Chops Grille may be the best in the RCI fleet. I was also very impressed with Giovanni's Kitchen. Being a large ship, Navigator carries a lot of passengers. However, I did not feel crowded and I had no problem getting on or off the ship in the various ports of call or in Southampton. Navigator is a family-friendly ship and inasmuch as the schools were not in session, there were quite a few children on the cruise. One young fellow became well-known throughout the ship for riding in the aft elevators and pushing all the buttons regardless of whether anyone wanted to go to those floors. In past years, the passengers on the Royal Caribbean cruises that I have taken of Southampton were almost all British. On Navigator, the British were in the majority but there was also a large number of North American guests. One day during the voyage, Navigator sailed in company with Independence of the Seas - - the other Royal Caribbean ship serving the British market in 2016. Within Royal Caribbean, there are several different types of cruise experience. The experience offered on Navigator is much more like the cruise experience offered on Independence than like the experiences offered on Anthem of the Seas and Brilliance of the Seas - - two of the other Royal Caribbean ships that have served the British market in recent years. This is not surprising as the Freedom class, which includes Independence, essentially is a longer version of the Voyager class. Thus, the two ships have similar features. Navigator's décor is also similar to Independence. Although it has been toned down a bit over the years, the look is often a somewhat flashy Las Vegas-style. Much different than the muted, up-market look of Anthem. This cruise took Navigator to some of the less visited ports in Spain - - Gijon, Bilboa and Vigo. This area of northern Spain differs from the better known areas of southern and eastern Spain in that it is a verdant green. However, because there is more rainfall, there are more cloudy days here. The ship was able to dock in each of the ports (no tendering) although there was no cruise terminal building in Gijon. The last day of the cruise, Navigator docked in Le Harve, a popular and well-developed port. The cruise lines like to market the port as Paris but it takes several hours to get to Paris from the port. Similarly, it is a long ride to the D-Day beaches, Mont St. Michel and Bayeux. However, these are world class attractions and so a long ride is worthwhile. Before the cruise, Royal Caribbean was offering a shore excursion to the Palace of Versailles, which is the first time I have seen any of the lines offering such an excursion. Unfortunately, the tour was canceled reportedly because of an event taking place at the palace. I hope that it will be offered in the future. The weather throughout this voyage was good and the sea posed no test of Navigator's nautical qualities. Navigator sailed smoothly with little motion on the open sea. Similarly, in the ports, she maneuvered in and out of her berths easily without assistance.